Santee is a charming town located on the eastern side of San Diego County California. Santeemay be growing quickly, but the community is dedicated to maintaining the eco-friendly atmosphere so loved in the area. With more of a country atmosphere, Santee is home to various types of properties on ample acreage without sacrificing any amenities. Only 20 minutes from Downtown San Diego, Santee really is the best of both worlds. The communities of Santee are peaceful, well maintained and contain homes which include luxury homes, many of which are situated along the popular Santee Lakes, along with starter homes on the smaller side throughout town. Other homes are located in gated communities which offer upscale town homes, condominiums and apartments that are fully equipped and are available with lots of green space. Potential homeowners will enjoy the newer multiple bedroom homes available, featuring “green” living with wind power, solar power, recycling and conservation systems to save energy and water usage. Large urban lots and home styles featuring Spanish, Tuscan, and Craftsman designs cover the vast Santee landscape. There are planned, family-oriented and environmentally-friendly community parks to keep families having fun and remaining healthy. The city of Santee hosts eight parks known as Mast, Shadow Hill, Sky Ranch, Town Center, West Hills, Aquatic Center, Mini-Park and Big Rock. The parks offer playgrounds, picnic areas, sporting courts, community centers, walking and jogging trails. 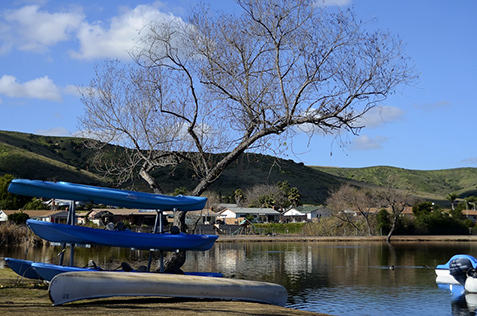 Mission Trails Regional Park and Santee Lakes Regional Parks, are Santee’s two major parks that are noteworthy on the U.S. national park listings, especially featuring its environmentally friendly wetland environments. Within these parks are natural and community amenities for vacation camping, fishing for all levels of this sport, hiking trails, bike trails, and boating. Located within the Santee real estate communities are recreational centers, walking trails and the best in educational institutions. The Santee municipality is proud to host several highly rated preschools, elementary, middle and high schools both public and private. 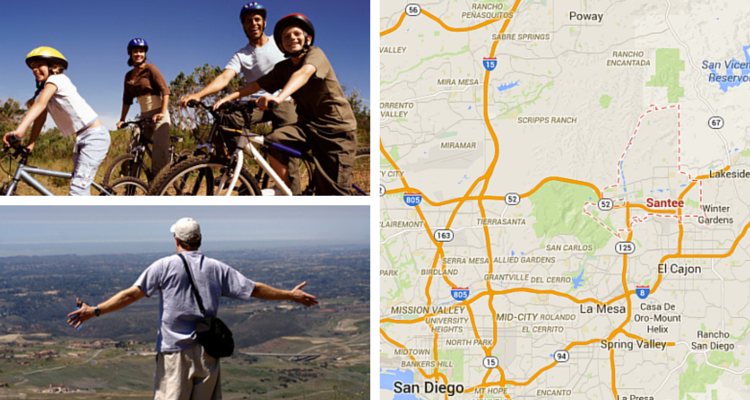 Only a short drive from San Diego, the universities and colleges there are also well within reach if you live here. Potential homeowners and Santee residents alike are drawn to the famous seven man-made lakes of Santee. The lakes are filled with a variety of fish species that bring top anglers from all around the country to its brimming shores, including Thursdays when the lakes are stocked with trout for the weekend. Summer lakeside concerts and movies are featured with fun, games , paddling, feeding the docks, and nighttime fireworks.